If you are thinking about building a detached garage plan, you probably have questions about the blueprints before you purchase them.Below are the six most commonly asked questions about our garage plans and their answers to help ensure you make the right decision when it comes to buying your garage plans. Can the garage plans be modified? Yes! If you’ve found a garage plan that is close to what you need, but it isn’t exactly perfect, our modification team can help you. Simply complete and submit our modification request from, and our modification team will provide a free quote for your changes within a couple of business days. This gives you an opportunity to find out what the extra costs will be for your project before you spend any money on blueprints. We recommend that you review our garage modification page to get a good understanding of how the modification process works and to download the modification request form. What is included in a set of garage blueprints? The garage plans published on our website are complete sets blueprints designed for each structure to be built from the ground up. They typically include floor plans, exterior elevations, a foundation plan, interior elevations when applicable, details and/or cross sections, simple plumbing and basic electrical information. NOTE 1: The information included in the blueprints varies from one designer to another. Please contact us with a specific plan number for verification regarding the elements included in a particular blueprint. NOTE 2: Our garage blueprints are actual construction drawings. We do not include any “how to” information or step-by-step instructions. It is necessary that you hire a builder to build your garage or have proficient knowledge of how to read a blueprint in order to build our garage plans. For additional information, please review our recent blog: What is Included in a Set of Garage Blueprints? How much does it cost to build a particular garage plan? Unfortunately, we do not provide an estimated cost to build or a material estimate for our designs. We know the costs for materials and labor vary greatly from one city to the next and sometimes even within the same city. It is impossible for us to know the going rates for materials and labor in all cities, counties, municipalities, etc. So, rather than guessing and quoting you a price that is much too high or much too low for your area, we recommend checking with a few local builders or lumberyards to find out what the going rates are for materials and labor in your area. Most will quote you a dollar amount per square foot, based on mid-grade materials, but it is best to confirm if they are quoting high-end materials, mid-grade, etc. Also, make sure to ask what the quote includes as sometimes it does not include foundation materials and a few other things. We realize this requires a little more research and work on for the person wishing to build a garage, but checking locally will provide you with a reasonable ballpark estimate. Will the garage plans meet my local building codes? Our plans are considered to be pre-drawn stock plans. They are designed to meet the national building codes in place at the time each plan was created. However, we do not guarantee the plans will meet all local building codes. Our plans are sold and built all over the US and Canada. The codes and requirements you have in your area may be completely different than the codes and requirements for someone building the same plan you are considering in another part of the country. It will be up to you/your builder to make any adjustments necessary to meet local building codes and requirements. You may need to hire a local design professional to add notes to the blueprints regarding some of your local building codes if your builder cannot make these adjustments at the jobsite or if you building department requires them to be shown on the plans in order to get building permits. We recommend talking with your builder and your building department to find out what is allowed in your city, county, etc. as far as making changes and adjustments to meet local building codes. Are the garage plans sealed or stamped by an engineer or architect? 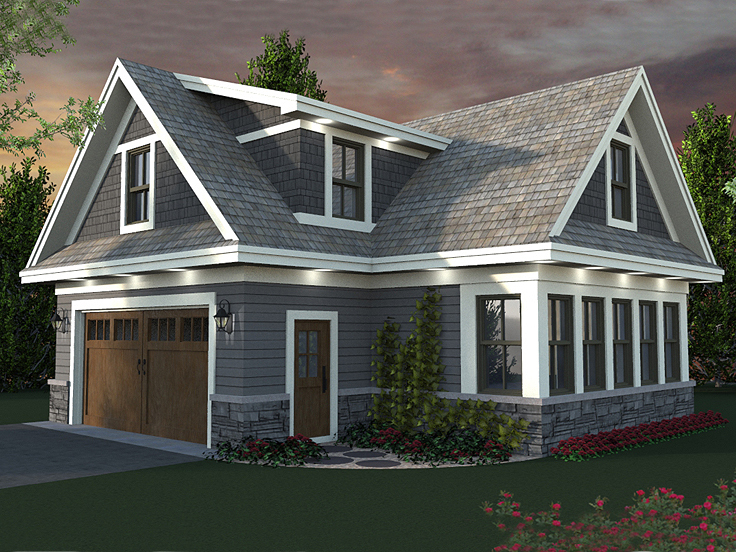 Our garage plans do not come with an engineer’s or an architect’s seal or stamp. They are considered pre-drawn, stock plans. This means they are designed to meet the national building codes in place at the time each plan was created. However, we do not guarantee the plans will meet all local building codes and requirements. Because our plans are sold and built all over the US and Canada, it is impossible for our designers to ensure they will meet all local codes for every location, city, county, municipality, etc. Therefore, our garage plans do not include a seal or stamp, as the seal/stamp is a local requirement. The items required for the seal/stamp in your area are completely different than the requirements for a customer building the same plan you are considering in another part of the country. Often the requirements that coincide with a seal/stamp for a particular state, province, city, etc., are influenced by climactic and geographic elements that are specific to the area where you plan to build making them local requirements. It will be up to you/your builder to hire a local professional to review and seal/stamp the plans. This professional must be licensed in the state/province where the structure is to be built. We recommend finding someone who can review the blueprints and provide a seal before you actually purchase plans. Sometimes the design professional providing the seal/stamp will have a preference as to which plan package he/she works with, and this will influence which plan package you purchase. Most likely he/she will want the CAD file or PDF because it is much easier to work with the electronic format when it comes to adding extra notes and elements to the plan that are necessary to meet local building codes. The only way to be sure about what plan package to purchase is to ask your local design professional before you make a blueprint purchase. Discover the answers to more garage plan questions like these by visiting our FAQs.